| Food & Supps | Amp Up Your Performance with Carbs! You compete – whether you’re an athlete or whether you’re scoring W’s at your day job, you need fuel to help you perform at your best. Performance nutrition is eating to fuel the demands of your sport, your position, or for your lifestyle. To do that, you need to know two things about how you compete: 1) What fuel are you primarily using and 2) how and when to get that fuel from your diet . What does your engine run on? For an athlete, this means understanding the type of work you are doing, the intensity you are doing it at and for what duration. For example, a recreational endurance runner may be going out for 40 minute runs at less than 80% max heart rate. This is what we call steady-state sub maximal endurance work. This type of work run primarily in the endurance engine and is fueled by the oxidation of carbohydrate. Here’s the catch – This engine can also oxidize lipids and amino acids (proteins) for fuels. We also know that this engine is principally housed in an “endurance” type muscle fiber. By contrast, a competitive sprinter competes at very short distances for very short durations, well above 80% to 100% of their maximal heart rate. This is maximal effort work. This type of work is fueled by anaerobic glycolysis and can only be fueled through the breakdown of glucose (carbohydrate). Maximal effort activities other than sprinting, lasting less than 90 seconds and having at least 2:00 minutes recovery, would also fall into this category (Beach & Earle, 2007). As a performance athlete both engines are rate-limited by carbohydrate. But the problem is this: When carbohydrate stores are low, there is an increased reliance on fat and protein for fuel. Metabolizing fat is great – especially for individuals with a high BMI and perhaps even for elite endurance runners for glycogen sparing. However, prolonged endurance training with insufficient carbohydrate can lead to an increased rate of skeletal muscle catabolism, as skeletal muscle is the body’s protein resivoir. Furthermore, time to exhaustion is greatly diminished in both the general and elite athlete population when carbohydrate becomes depleted (whether by adhering to a low carbohydrate diet as in the case of the general client, or due to exhaustive physical work as in the case of the competitive athlete (Gillum,Dumke, & Ruby, 2006)). For the endurance athlete, carbohydrate REPLETION as well as carbohydrate SPARING are two critical concepts for ongoing performance objectives. Competitive athletes who may exert themselves for 2-4 hours continuously or longer, depend greatly on a supply of a simple carbohydrate solution throughout training to help spare carbohydrate stores by keeping blood glucose levels maintained throughout the competition. This strategy also helps minimize catabolism of the working muscle as a fuel source (Gillum,Dumke, & Ruby, 2006; Jeukendrup, Jentjens,& Moseley, 2005). The maximal effort athlete, however, has no such ‘alternative fuel’ reserve; fats and amino acids cannot supply energy to the max effort athlete DURING training. Which means making sure the maximal effort athlete not only has ample amounts of intra-muscular carbohydrate stored up, but ALSO has been trained to become efficient at utilizing carbohydrate at an optimal rate is critical to performance outcomes (parallel this to adjusting your fuel intake – flooding the engine is just as bad as choking it off). Through this highly remedial discussion (<<<disclaimer) it is already apparent that we have two divergent pathways – two distinct metabolic demands which necessitate two distinct training and nutritive environments to sustain their respective performance objectives. Oxidative Metabolism (aka endurance) occurs during steady-state sub maximal work efforts defined as below 75% VO2 max and corresponding to approximately 80-85% of your Max Heart Rate. 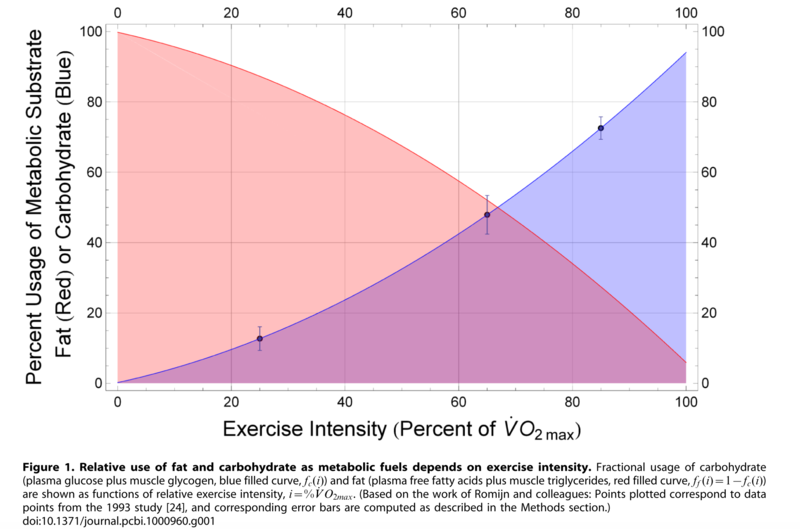 At very low intensities <60%VO2 Max fat is the primary fuel source. Anaerobic Glycolysis occurs under short duration (Less than ~90seconds) high-intensity work efforts above 75% to 110% VO2 Max and corresponds to approximately 85% MHR or higher. THE CATCH: also requires at a minimum 2:00 minutes or longer rest between work efforts. Because the endurance pathway can oxidize amino acids as a fuel source, endurance training can have unwanted effects on strength training (or strength/power/speed athletes who depend on having a high density of muscle for performance) by diminishing anabolic protein mechanisms and promoting an often negative net protein balance due to exhaustive endurance training. Although we won’t discus the mechanism in detail here, it is important to note that there is a chemical inhibition of protein synthesis by endurance training (Nader, 2006). It can be very costly to a trained strength/power/speed athlete to engage in endurance activities. There is no negative crossover effect of strength training to the endurance athlete. Are you a wellness client looking to reduce body fat and improve cardiovascular fitness? If yes, go to 3. Are you an endurance athlete looking to improve your (A) time or (B) looking to increase your training volume? If yes go to 1. Are you a power-sport athlete looking to increase (A) strength (B) power and/or speed? If yes, go to 2. Special Cases: Are you a sport that requires both aerobic and anaerobic qualities such as fight sports or sprit multi-sport athletes? If yes, go to ‘Nutrient Timing-Does it Matter, 4’. There may be critical times in all distance races requiring anaerobic effort – for example, a surge, a hill, or a sprint finish. Therefore improving your anaerobic capacity (increasing intensity above 75%VO2 max) may be a necessary component of your training regiment. On training days where you may introduce short interval training to improve speed, consuming 5-7g/kg CHO minimally will ensure sufficient carbohydrate for your training. Increasing your training volume (recommended not more than 10% per week) will ultimately increase the duration of your run (or bike or swim) and therefore lead to increased intra-session carbohydrate depletion. This may warrant up to 7-12g/kg of carbohydrate per day during prolonged training sessions (Bernardot, 2012). A sipping protocol of not more than 8% carbohydrate solution should be utilized throughout the training session (Bernardot, 2012), and nutrient timing strategies should also be utilized to help sufficiently replenish carbohydrate stores for the following session. In a training phase designed to increase muscle volume and strength, the amount of mechanical work -especially eccentric work -can lead to an increased rate of protein break down. Depending on the intensity, type and volume of training, extra carbohydrate consumption may be warranted to help the athlete recover. 7-10g/kg/day may be warranted for high volume, or highly eccentric training programs. Power and short sprint athletes depend on a high amount of carbohydrate stores for performance. Compared to athletes on a low or moderate carbohydrate diet, sprinters on a high carbohydrate diet outperformed low and moderate carbohydrate intake. Assuming ample recovery time between performance bouts (3:00-10:00min), consuming 5-7g/kg daily should suffice. During the recovery time, athletes should utilize a sipping protocol of an 8% carbohydrate solution to top of blood glucose levels between events. Additionally the high dependency on the phosphagen pathway in the short sprints (not discussed in this article) may underscore the importance of dietary creatine (from meat and fish) in performance outcomes. Vegetarian speed athletes should also be mindful of consuming sufficient protein/ calories to allow the body to synthesize creatine (Bernardot, 2012). To reiterate – the Lb-for-Lb rule does apply. But you need to know HOW it applies to you. Your Lb-for-Lb situation will influence the relative amount of carbohydrate, protein, and fat you must consume to best meet your performance goals. Low carb to reduce body fat and improve insulin sensitivity. Abete, Parra, De Morentin, and Martinez (2009) found low-carbohydrate, high protein diets to be associated with not only a greater weight loss but also activation of mitochondrial oxidation. The authors suggest that this increase in mitochondrial activity correlated with increased resting energy expenditure, which is important to weight loss. Meckling, Gauthier, Grubb, and Sanford, (2002) found no significant alterations in fasting blood glucose, serum insulin, or oral glucose tolerance when carbohydrate restriction was limited to 70g/day or less in combination with calorie restriction. Their findings indicate that such low-carb fad-diets do not pose a significant risk to glucose tolerance in women. These findings are supported by the meta-analysis by Shikany, Desmond, McCubrey, and Allison (2011), which showed carbohydrate-restricted diets to be comparable or better than traditional low-fat high-carbohydrate diets: “Overall there is a growing body of evidence that carbohydrate-restricted diets are more effective, at least in the short term, for reducing weight and improving insulin sensitivity without significant adverse cardiovascular effects” (Shikany et al., 2011, p. 533). Based on the present findings, low-carb Paleo-type diets of 2-3g/kg/day may be appropriate for non-performance weight loss and may help improve insulin sensitivity, particularly in combination with low to moderate intensity endurance training (below 70% VO2 max or approximately 80% maximum heart rate). If you have 24-hours between practices/training sessions more than likely nutrient timing is not a significant aspect of macronutrient consumption. Carbohydrate repletion of exercising skeletal muscle is generally topped off to normative values by 24-hours after training, regardless of the consumption strategy utilized. Nutrient timing becomes increasingly more important when multiple practice sessions or games are played in one day. In this case, nutrient repletion strategies depend greatly on the timing of ingestion as well as specific combination of macros to enhance absorption. In situations where athletes may be practicing in extreme environmental conditions (heat, humidity, cold, or at altitude) for prolonged periods of time (for example, summer team sport practices that may be 3+ hours per day), nutrient timing becomes more critical to mitigate protein breakdown due to increased metabolic rate (energy expenditure) associated with such extreme environmental conditions (Askew, 1995). The following does not apply if you are a teenager or an athlete in your early 20s. For the rest of us “older athletes” avoiding a late night insulin spike from a carbohydrate rich post-practice meal is probably wise to avoid unwanted increases in body-fat. However, a protein rich meal of 40g of protein has been shown to improve muscle recovery during sleep. Therefore a recommended strategy for ‘older athletes’ in late night practices would be to consume a low-moderate carbohydrate, high-protein meal after practice to stop practice-induced protein catabolism and promote positive protein turnover throughout the night. Given that glycogen stores are typically recovered by 24 hours, your carbohydrate intake throughout the day should lead to sufficient glycogen repletion by the following practice. Multi sport athletes generally have multiple training sessions per-day, in which case nutrient timing becomes an important factor in recovery for subsequent trainings. Elderly populations are at greater risk for age-related sarcopenia (muscle wasting). To mitigate muscle protein breakdown after completing an exercise routine, it may particularly benefit elderly populations to recover by consuming 1.2g/kg carbohydrate per hour for four hours after exercising. There are clearly many factors that affect what you eat, when, to eat and how much to eat. And because these variables play and integral role in performance, all ENG programs include customized macros AND suggested nutrient timing schedules to help you maximize your performance! Abete, I., Parra, D., De Morentin, B. M., & Martinez, J. A. (2009). Effects of two energy-restricted diets differing in the carbohydrate/protein ratio on weight loss and oxidative changes of obese men. International Journal of Food Sciences and Nutrition, 60(S3), 1–13. Benardot, D. (2012). Advanced Sports Nutrition (2nd ed.). Champaign, IL: Human Kinetics. Jeukendrup, A. E., Jentjens, R. L. P. G., & Moseley, L. (2005). Nutritional Considerations in Triathlon. Sports Medicine, 35(2), 163–181. Slater, G., & Phillips, S. M. (2011). Nutrition guidelines for strength sports: Sprinting, weightlifting, throwing events, and bodybuilding. Journal of Sports Sciences, 29(S1), S67–S77. Poole, C., Wilborn, C., Taylor, L., & Kerksick, C. (2010). The role of post-exercise nutrient administration on muscle protein synthesis and glycogen synthesis. Journal of Sports Science and Medicine, 9, 354–363.